A question that everyone has when starting out in testing is: What kind of future career can I have? Some career paths or job positions lead to dead ends in which there are no opportunities for growth or advancement and others foster continuous learning, allowing one to move up naturally. This is what happens in the area of testing: with time and practice, we become better testers and can aspire for better positions, higher salaries, more responsibilities, more challenging tasks, and more training. We always continue learning and eventually our capabilities become greater than what our position calls for. In reality, there is not one “career path of a software tester” as one can take many different paths, specializing and growing in a certain branch of testing or moving into other business areas. It is good to have it clear in your mind which path you want to take beforehand, in order to know which skills to hone, which projects to take on, etc. In the following infographic you can see an outline that represents some of the possibilities that you have as you move up in testing. 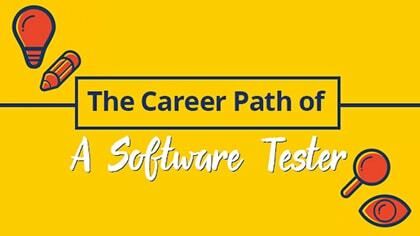 The Ministry of Testing created a very detailed mind map in which they did a very good analysis of the future of software testing, and in particular, the possible career path of a software tester. Here we will break down some of the possible ways one can advance in testing. Keep in mind that everyone will end up having a journey uniquely their own. One of the greatest advantages of software testing, I think, that other IT professions don’t have is that you can get started with little technical background in programming and the like. Part of the analysis done below is based upon the survey of wages in the world of testing that expo:QA conducted. After this, one becomes a “Senior Tester.” Typically, a senior tester has 3-10 years of testing experience and may specialize in testing applications that are made for certain industries such as finance, healthcare, tech, etc. People with experience in the testing field can go into specialized services. This is where consultants come into play, which basically add value with their knowledge and experience by identifying problems and suggesting improvements to teams, teaching them tools to use or how to adapt to processes and methodologies. If you want to take the consulting path, I highly recommend this book by Gerald M. Weinberg, The Secrets of Consulting: A Guide to Giving and Getting Advice Successfully. I am reading it now and I love it! Next come the management roles. These people are in charge of organizing the work that needs to be done and assigning testers to do specific tasks. In accordance with the years of experience one may have, we see people who are “junior test managers” or “senior test managers.” The size of the teams that they manage correlates with how much experience they have. In some businesses, one person has to manage the tests of many applications, and in others, they are just dedicated to one in particular. Here is where communication, leadership, and organizational skills are essential to be successful. There are some testers that learn programming (or programmers that learn testing) and are able to be in charge of tasks that are more technical in testing. Is there a ceiling to the possibilities? One last thought, in response to the Spanish version of this post that I wrote, many people have asked me more questions about getting involved in testing that I want to answer here as well. What if I like to design tests and execute them but don’t want to be a manager or get into very technical testing? Are these timelines of growth fixed? What comes after all of these positions? Is there a ceiling to the possibilities? As you go along in your testing career, you will begin to discover what areas you do and do not like and will get a better feeling for the possibilities that are available to you. For example, as you work in a team and see the synergy that exists, you may be interested in learning how to organize projects and divide up the work, becoming a test manager. Another example could be you notice that some tests can be automated to save time and eliminate the need to do repetitive things. Then, you may find out that you want to learn automation and acquire this new skill that you didn’t have before. Of course, after all of the possible paths that we mentioned before, there are still dozens more. One can specialize in the agile world, vary in the types of tests and tools, become an expert in the area of business, conduct research in the field of testing, or inspire others to become testers by speaking at conferences, attending meetups, and disseminating knowledge through blogs (like this one! ), social media, or teaching courses and workshops. If you take up testing, your career path is certainly not set in stone and there’s not just one way to grow. Some people will move more quickly through the stages than others. To advance, one should get carried away with making sure to continuously improve one’s skills, growing as a person, and exploring one’s potential. I hope that this helps clarify the potential career path of a software tester and all of the opportunities that are open to someone who is just starting. We would like to invite you, if you’re interested, to join us over here on the dark side (just kidding, in reality, it’s more like the bright side of IT!). No matter how much experience you have (or lack thereof) feel free to contact us at [email protected], telling us what you want to learn how to test, the skills you may have already, and what kind of path you wish to take, because not only do we offer testing services, but also comprehensive, customizable training. When it comes to the career path of a software tester, the sky is the limit! Footnote: I am basing this off of the achievements that I have seen of many testers that I know of in the USA, Uruguay, Argentina, Spain, Italy, Brazil, and people that I have come across in conferences, meetups, etc. I also read many of my peer’s articles, etc. and I feel inspired by them. Thanks to all of you, I realize that there really is no ceiling to software testing! Yep, been there and done all of that over the last 28 years. Now I do consulting work trying to help companies implement tools and process for automation and performance. Never a dull moment. And I’ll be at it for another 10-15 years until I finally retire. So yes, there is a career here for people who know what they are doing and can show it. Testing is not dead. One thing to remember, as it is with software, there are many inputs and outputs. In companies where I have worked, people from outside software test slide into testing for one or more reasons (subject matter experts on the software, developers who are tired of coding, support personnel, etc.). And once someone gets to a certain level, they may move out to other areas of Engineering (Project Managers for experienced leads, Business Analysts, Documentation, Beta testing, usability, UAT, etc.). Most good companies and managers look for the best way for their people to take advantage of their skills and opportunities within the company. Keeping someone locked away in testing could be the death knell to their career and the reason why a great tester leaves. I am a QA lead for multiple products but the best part I loved about my work was getting to do things outside of testing as well such as helping out SMEs with spec writing, support etc. but recently my group is going thru some changes and upper management is forcing roles & responsibility in black and white…meaning a tester should stick to testing activities. This is where my motivation is dying. I am planning to start MBA and move up in more senior management role..but I do think if I had to start over, I wouldn’t have gotten into testing career. For advancement there seems to either more technical expertise like automation career or management. How do you see a TA/QA role in Agile? The environment within a scrum team does allow more opportunities to become a BA or developer or another role so their career path is widened. However, there is the concept that it is not roles but skills that are required in a Scrum Team so does a TA or QA exist anymore in their own right? My view is that the TA or QA could be supporting the completion of user stories, they could code, or facilitate within the team. But they should also influence the team based on their primary test skills. I would be interested on your thoughts? From my point of view, agile is not a treat, it’s a new opportunity for us testers, to have more growing possibilities, to be protagonists and an agent of change. It’s true that there are no “roles”, but there are “specialties”, what I mean by “specialties” is people within the team with more capabilities and skills for testing. Testing is a core activity, because Scrum combined with XP for example, suggest using TDD, or if you do BDD or ATDD, your development starts with “how would I test that?”, “what’s the acceptance criteria?”. You see? Testing is helping to define the product! Hello, thank you for your post. I am exploring the possibility of becoming a software tester. I majored in computer science and have taught programming for a while. I have never programmed commercially, but have done it more like a hobby, writing simple Java programs and a few simple Android apps. I have searched for an opportunity to work on the IT field, to supplement my income or to do contract work. I am now absorbed by this new possibility in software testing. I also thought to my self that, no matter how fast the tech field evolves, there should always be a need for software testers. I looked at software development, particularly mobile app development, and took a couple of courses over the last year. But as a middle aged man with family responsibilities, and the fast pace of the development industry, I thought that perhaps I would enjoy testing. If you could please recommend a training program, perhaps online, for a busy individual like me, please let me know. Thank you for your article! Hi Peter! I am glad you liked this post. We actually have created a software testing course, a performance testing certification in JMeter and BlazeMeter. As the director of the course, I highly recommend it! This course is unique and could serve you well because the instructors have been testing professionally for years and years and take on a mentorship role for anyone who wants to advance their testing careers. Although you might not have much experience in testing, they can point you to the right resources and information to get going, whether its with performance testing or other areas. Look out also for our test automation course coming later this summer. Additionally, I think that learning mobile testing would be a great avenue for you! In the latest “State of the Profession of Software Testing” report by TechWell, the number one kind of testing that the community lacks knowledge of and skills in is mobile.